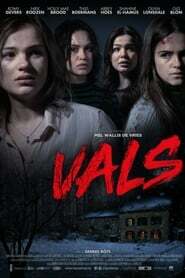 There was already a musical version of the youth thriller Vals from 2010, now there is also the film about the award-winning youth book by the popular Welcome Home writer Mel Wallis de Vries. Four girlfriends, Kim, Abby, Feline and Pippa, go on girls’ weekend in the Ardennes. The car ride to Belgium is used to highlight their different characters. Newcomer Pippa is an assertive cheek, Kim a shy inner grease. Abby is Kim’s best friend, but Abby moves more and more to Pippa and is a bit bitter against Kim. Feline seems to be sitting with something. On the way the reckless Pippa drives almost three students whom she invites, much against the wishes of Feline. During the evening-filled cheese fondue that comes with drink, mysterious things happen. The claustrophobic Kim is briefly locked in the toilet, Feline Death Note disappears without trace. Losbol Pippa manipulates loose, but why does she do that? Almost everyone has a secret that will be revealed during the weekend. False has a typical thrill structure, Little information is withheld and there is (false) indications scattered. For example, the teenagers fill up at a gasoline station that suddenly leaves a scary man in hunter’s jacket. One of the students behaves a bit strange and withdraws in a corner. Kim imagines to see guises in front of the window, and Pippa makes, for mysterious reasons, photographs of a vomiting Kim and Abby kissing with a boy. Vals also uses a somewhat gagged convention, that of the mobile phone which first has reach but the second day suddenly no longer. It is also snowing heavily which restricts the freedom of movement of the characters and the four are trapped as rats. Messy details are annoying. The girls want to call the boys off while they have not exchanged phone numbers anywhere. And is not it strange that the toilet is locked from the outside?